Little Boy is the name that was given to the first atomic bomb that was dropped in a war. 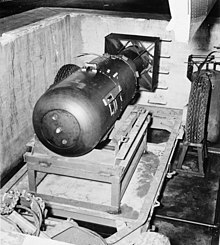 The bomb was dropped on the Japanese city of Hiroshima on 6 August 1945 by the American army who were trying to end World War II. Enola Gay was the name of the plane that dropped Little Boy. ↑ Key Stage Three History: The Study Guide (First ed.). Coordination Group Publications. 2002. p. 54. ISBN 1841463302. ↑ Trueman, Chris. "The Atomic Bomb". History Learning Site. Retrieved 2011-03-01. This page was last changed on 17 September 2016, at 15:26.